One place you do not expect to capture UFOs at is around Washington, DC and especially not during the Cold War in 1952. But, such a thing was captured on film. 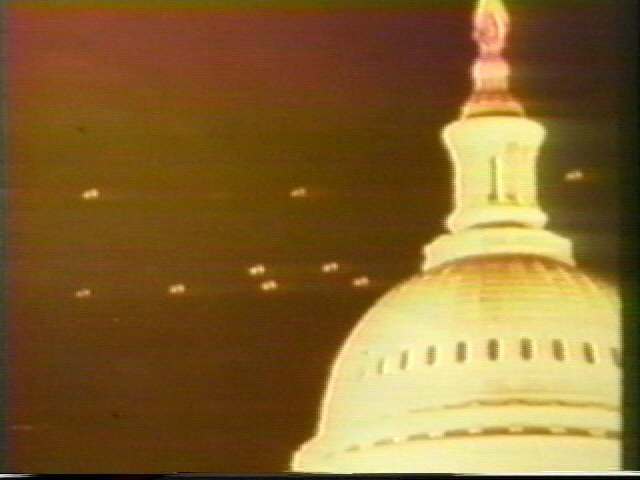 July 19, 1952: Perhaps the most amazing UFO incident, and well documented, occurred in our nation's capital. Seven objects were seen on radar. The air traffic controllers knew something was odd. The movements were impossible by current aircraft standards. Another capital area traffic control tower also confirmed the objects. Peering our the window of the tower, a controlled reported seeing a bright orange light. Then, something horrible happened. Seven objects appeared and moved over the White House. Andrews Air Force Base 10 miles away was called. Although Andrews AFB didn't report anything on radar, an airman looked out the window to see an orange ball of fire with a tail. Suddenly, the object took off at an unbelievable speed. At that time, a controller at National reported a large orange disk. Then, 6 fast moving white tailless objects were seen. One sergeant reported an orange red light that would stay still, then move in impossible positions and speeds. An object hovered over the radar beacon. Then, all 3 centers tracking it said it vanished. After much cat and mouse behavior, the disks were last seen 6 hours after they first arrived, all of them turning skyward and flashing away with great speed. One week later, a National Airline stewardess saw objects above her plane. Soon, radar centers neraby were watching the objects. They were reported to be moving at unusually high speed. The sightings on radar ended around sunrise and pilots in fighter jets saw the light, but were unable to keep up with it. The military (of course) explained them as meteors or stars. This remains one of the most professionally witnessed, documented and threatening encounters with the unknown in our nation's history. Interestingly, in 1952 an RAF pilot had a UFO incident that left him convinced we are not alone. (LINK) Flight Sergeant Roland Hughes was returning to base when he was followed by a 'gleaming silver, metallic disc' which flew alongside him before disappearing at incredible sped. It's always intriguing to find that a certain year was particularly more active UFO-wise than others. It says that perhaps this was a time of great observation of us or perhaps we were doing something that instigated the need to visit. In 1952, Project Blue Book began. This was a program to study the explanations for UFOs. Those who believe the government has hidden their own weapons/craft programs by making us believe they are UFOs, this is a significant time. We started seeing more UFOs that year and they officially start a program to study UFOs. That is kind of like parading your beautiful daughter and then starting a beauty pageant. One has to wonder if they took advantage of our thoughts they were from other worlds and acted as if they "gosh-darned dunno" where they came from. Another camp could look at 1952, a pivotal year where UFO's came to the Capital, causing our government to get concerned and start studying these crazy objects in the sky. No matter how you look at UFO phenomenon, 1952 was an important year.